“Hi Carole, I just want to say a big thank you for a lovely experience today. I really enjoyed your approach to floristry and thought the day was very interesting and insightful. I also loved that you took us to visit your allotment plots, I’m in awe, so wonderful to have that space! “I’d like to say that I attended your workshop last year as I was considering doing my daughter’s wedding flowers in November. I just wanted to thank you, as attending the workshop gave me the confidence to do all of the wedding flowers: 4 bouquets, buttonholes, all the table decorations and a foliage swag! Really enjoyed it and had so many compliments. Thank you again for making me believe that I could do it.” Nia C. January 2019. “Hi, did enjoy your talk this morning. Thanks. Inspired to be more creative with arrangements. My apple tree was pruned on Monday… will know to keep some branches another time!” Mary R., Making a Cutting Garden talk, Kings Heath U3A Gardening Group, March 2018. 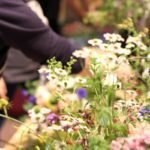 “Great talk and flower arrangement tonight” Karol Doveston, Cutting Garden talk and hand-tied demo, Cotteridge Gardening Club September 2017. “Thankyou so much I had a lovely time and learnt lots.” Lorraine Moult, 1:1 Cutting Garden workshop, September 2017. “Hi Carole, I really loved the workshop at Winterbourne on Saturday and gifted the bouquet to myself for all the mothering I have done in my life without actually being a mother! The staff were asking me if I would do another workshop with you if it was scheduled I said yes and mentioned Christmas wreaths a couple of times…..” Ruth Livermore, spring bouquet Mothers Day workshop, March 2017. “Thanks for the workshop last night. Lesley and I really enjoyed it and I’m really pleased with my wreath – I think it’s even better than last year’s!” Sheelagh, annual workshopper. “I had such a great day yesterday: beautiful flowers, relaxed environment and lots of laughter resulted in very creative arrangements! Thank you for sharing so much of your experience, feeling inspired and confident to get going with funeral flowers.” Anthea Birden, bespoke funeral flowers workshop, June 2018. “If I was asked to sum up our day I would say it was filled with generosity. The sharing, the flowers, the marketing info, the lunch…. Thank you so much.” Elke Heckel, bespoke funeral flowers workshop, June 2018. “Just wanted to say thank you for coming over last night and sharing your expertise of making Christmas wreaths with my friends. We all had a fabulous night and they have all gone home with beautiful creations.” Rachel Mellor, bespoke Christmas workshop for 7, December 2017. “Just a short note to say thank you so much for the workshop last week. You made producing something truly special and unique to each person so easy and allowed us all to far exceed our own personal expectations. I have received so many compliments on the wreath I created and each time I see it I remember our lovely evening. The materials were beautiful (and bountiful) and the approach so relaxed and encouraging that we all felt truly ready for the season when we finished! If you are running workshops on summer flowers I would love to come so I shall be signing up to your mailing list.” Clare T., bespoke Christmas workshop for 6, December 2017. “I really enjoyed our morning together and believe you me I learnt alot too. Thank you. (And thank you for the notes). ” Anna Briggs, 1:1 half-day workshop. September 2016. “Thank you so much for making being creative so much fun, I thoroughly enjoyed myself last night and hung my wreath up as I walked in the door.” Dawne, first-time wreath maker, bespoke workshop participant. “Everyone loved last night and it was such a well planned event.” Debbie Assinder, Rodborough Consulting. Organiser of bespoke Christmas Wreath making session for 10.